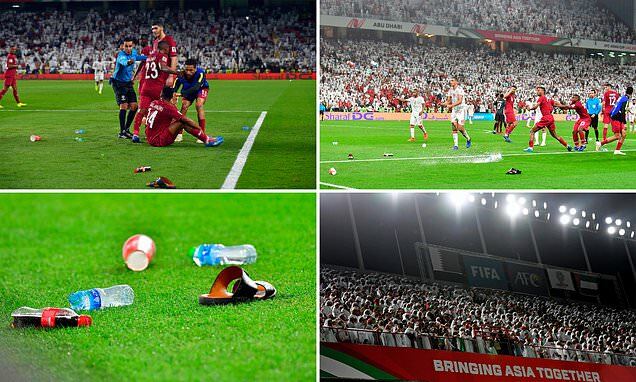 Qatari players were pelted with shoes by United Arab Emirates fans as they battered the home team 4-0 in the semi-final of the Asian Cup in Abu Dhabi. Qatar were expected to face a hostile home crowd at the packed 43,000-seat Mohammed Bin Zayed Stadium, where the sport authority offered free tickets to UAE fans. As the Qataris celebrated their second goal, the Emiratis erupted in jeers and began throwing their sandals onto the field of play - a deeply offensive gesture in Arab culture. Off the pitch the countries are locked in a diplomatic dispute with the UAE accusing Doha of backing Islamist terror and Shiite Iran - the UAE in contrast has close ties with Sunni Saudi Arabia. The missiles were thrown as the Qataris celebrated their second goal before the first half was even over. The disreputable conduct extended onto the field of play late into the game, as one of the UAE players was shown a straight red card in stoppage time. Showing the sole of a shoe or sandal in Arab culture is seen as deeply offensive, while being struck by it is even worse.